However, the AWW article also exposed Bobbie Houston’s incompetence as a “pastor”. Bobbie Houston does not fit the requirements of a pastor, not only because she is a woman (which the bible forbids). The information she disclosed in regard to Frank Houston’s pedophilia and the way it was managed by Brian. In what she did reveal about Brian back in 1999, (if her husband told her the truth about his dealing with the allegations), then she is complicit in the cover-up as exposed by the Royal Commission. Although these are three main points stressed in this article, there are five issues that need to be addressed in the AWW due to what she disclosed to them. NOTE BEFORE READING: If Brian lied to her or hid information, Bobbie now has no excuse for continuing in the charade. As a Snr Pastor of Hillsong, she has a responsibility to look at the material presented in the Royal Commission and the lack of care and compassion shown the victims by Frank and Brian Houston, his family and the church that Frank had pastored. Bobbie has some serious questions to answer, especially why it took a Royal Commission for Australia, AOG ministers and members of Hillsong church, to find out about Australian victim, AHA, that the AOGA executive decided to keep it confidential. The RC exposed that Brian, despite his conflict of interest, denied the victim an independent investigation, failed to follow procedure and took over the investigation himself. Brian and the Australian Assemblies of God executive failed to report the abuse to police, which was mandatory. The RC findings highlighted many management failures. Bobbie Houston has lied to the media, influenced her congregation and continues with spin-control to minimise the fallout from the clear bungling and apparent cover-up by her husband Brian, which can be read in the Royal Commission Report. Why would Bobbie Houston think it appropriate to reveal personal and pastoral information about an individual to one of Australia’s leading magazines, especially when it wasn’t in the interest of the individual? Maybe Bobbie’s words had more to do with Hillsong leveraging from the individual’s celebrity status? What sort of person would do this, let alone a pastor? 1. Pastors shouldn’t parade the attendance of “celebrities” as a badge of honor in order to promote their churches. God’s Word accuses this type of person as a judge “with evil thoughts”. 2. Pastors shouldn’t be revealing personal information about one of their members, especially when it is not in the best interests of that member. How does disclosing this information help Justin Bieber? Pastors shouldn’t lie to their congregation and they should never lie to the press. Hillsong is renowned for these tactics [here, here, here, here, here] in their attempt to try and hide their false doctrine [here] and dark history [here, here]. There are two lies in the above statement. No one is ‘forced’ to give. However, Bobbie fails to mention the extremes to which Hillsong goes to manipulate their congregations every Sunday – that it is necessary for their members to give money, and at least 10% of their income. Hillsong leaders are in a hugely powerful position of influence and trust. Many congregants will believe what they are told, the pressure and coercion, and give happily because they believe the false doctrine taught at Hillsong. Bobbie Houston, as with the rest of Hillsong leadership, need to be held responsible for allowing the media to believe they do not manipulate or coerce people into giving. ISSUE 3 – Bobbie Knew About Australian Victim, AHA – so, was she complicit in the cover-up? “Yet the business nearly came crashing down in 1999, when Frank left under a very dark cloud. Behind closed doors, Brian stripped his father of his ministry following accusations received from a man who claimed Frank had sexually abused him when he was seven years old, in 1969 and 1970, while he was a house guest of the victim’s parents in Sydney. It’s a day Bobbie will never forget. Lie: Brian did not fire his father immediately after Frank’s confession in Nov 1999. Frank Houston was allowed to resign a year later (24 Dec, 2000) after a new batch of child sexual abuse was confirmed with the New Zealand Assemblies of God. 2000/11/24 Frank submits his retirement letter to “Hillsong City Church”. Up until the Royal Commission in 2014, the public, the media and most of the ministers in the Australian Assemblies of God, still thought Frank had one abuse victim in New Zealand before he moved to Australia. Brian Houston, Hillsong leaders and the Australian Assemblies of God executive who knew the real story (that there were several young boy victims – an Australian and others from NZ), were content to hide behind this illusion for 13 years – the illusion that they started in the first place (here, here, here). This misinformation allowed them to cover-up the Australian victim’s affairs with Frank Houston and Brian Houston back in 1999-2000. ISSUE 4 – Did Brian Houston lie to Bobbie and daughter, Laura? Firstly, Brian would only have to report a victim of child sexual abuse to police if the victim was Australian. It is reasonable to assume Bobbie knew the victim was Australian from her comments. Secondly, Bobbie’s statement is false. Like her husband, she continues misleading the media and the general public about the findings of the Royal Commission. Does Bobbie know the truth or only what Brian told her? Why doesn’t Bobbie read the RC findings? Bobbie continues to perpetuate the idea that AHA was so brittle that he never wanted to go to court or have a proper investigation. This allows Brian to hide behind his victim, but contradicts evidence given at the Royal Commission. Ps. Barbara Taylor knew AHA had been to see a Chamber Magistrate and informed Brian at his meeting with her that there “was a possibility that [AHA] would go to court“. See (Trans88/Page 9330). Brian also chose not to tell the AOGA executive about Ps. Taylor and her efforts in trying to get the AOG executive to deal with the matter for over a year before Nov 1999. Hence the AOGA executive thought Brian was the only person who could talk to the victim. So, did Brian Houston lie to his own wife and daughter about AHA? Why wasn’t she upfront with CLC/Hillsong in 1999? Why did she allow her husband to deal solely with this matter (the victim and perpetrator), behind closed doors, given his obvious conflict of interest? Why did she agree to remain silent about all of this until now? For Bobbie Houston to be considered a “pastor” but condone her husband’s cover-up of the AHA scandal (and the later expose of NZ victims), is a disgrace. Doesn’t Bobbie think it odd that Brian, after the Royal Commission, tried to claim special clergy privilege as an excuse for why he didn’t report the AHA abuse to the police? Yet he told Bobbie and Laura? While wanting protection for maintaining confidentiality of his father’s confession, Brian also tried to convince the RC he was upfront with his church and the 2000 Hillsong Conference about his father’s abuse! Can Bobbie back up Brian, and remember when and what he told the church and conference? At the RC Brian could provide no evidence, and could not remember details (when, what, and to whom). Did Bobbie realise that Brian being “upfront” with the church would go against the specific directive from the AOGA executive that it was to remain confidential? All inquiries were to be directed to AOGA executive, J. Lewis. So why would Brian be telling his church? Did Brian tell her about the AOGA directive to keep it confidential? Did Bobbie realise the media had the wrong story over all those years? Did she think it should be corrected, especially as Brian had several opportunities to clarify the matter with the media? Or was Bobbie content with the conflation of both investigations and the misinformation? How upfront was Brian with her? The final word in the article is from a parishoner – when asked how she felt about the Frank Houston case. Brian and Bobbie have managed to convince their followers that poor Brian (who acted with such integrity and honesty), was being unfairly called upon and unfairly persecuted by the Royal Commission to explain how he and the executives representing their institutions (AOGA and Hillsong) responded to allegations of child sexual abuse. The issue is this: did Bobbie see how the RC exposed Brian lying to Ps Taylor? Did Bobbie know about this (and Brian’s bad report card from the RC) when declaring her husband’s integrity? Brian was not being persecuted for a dead man’s crimes but rather questioned about how he handled the matter as head of both Hillsong/CLC and the AOGA. Brian did not remove himself from the investigation when he had an obvious conflict of interest, did not follow procedure and did not report his father to police. Furthermore, both Brian and the AOGA conflated both disciplines to hide their cover-up of the AHA matter. Issue 5 – Did Frank lie to Bobbie and Brian Houston? Why did Bobbie differ to Brian about Frank? Brian: “I would like to think he’s in heaven. God, in my mind – God is more gracious than any of us, God is more forgiving than any of us. I feel like um, ahh you know, he definitely did everything he could, I believe to make things right, make his peace with God after these things. Bobbie may be totally unaware that Frank led Ps Taylor and victim AHA on a merry dance for several months, delaying meetings with them until he finally passed Sydney CLC on to Brian, his son. Frank also phoned Ps. Taylor angrily in May 1999 because she kept following him up on his broken promises to meet with both her and AHA. 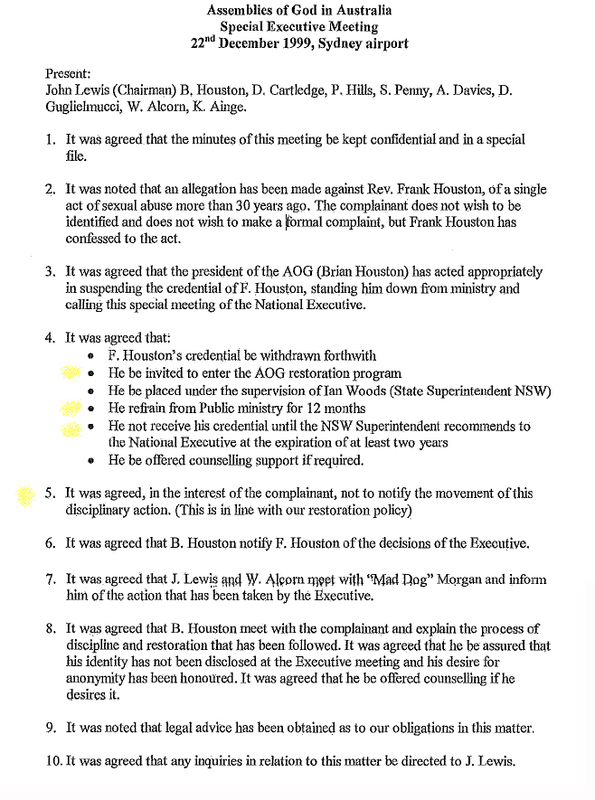 Later in December 2002, Powell’s publication triggered the AOGA Exec to finally inform its ministers about Frank Houston being disciplined for moral failure (here) and CWM breaks the story of Frank Houston’s morale failure along with Barney Coombes’s dealings with Frank Houston who denied wrong doing back in the 1970s. Frank denied, evaded, threatened, avoided, betrayed, undermined and remained secretive over his crimes. These were not the actions of a repentant soul. It is suspected Frank moved his family to Sydney in 1976 due more ominous reasons than a calling from God. Frank could have turned himself in, publicly repented to his church (biblical), met with victims who requested it, and generally tried to help his victims achieve some measure of closure and justice. He didn’t. There is little evidence of compassion or actions consistent with repentance (apart from Frank trying to pay AHA some money [$12,000] in exchange for forgiveness). Frank was never charged and the victims were denied justice. And what type of person would have such little compassion as to continue in their drive for self-gratification at the expense of a terrified child, knowing the child would be damaged for life. Frank knew he was disqualified as a pastor. Frank knew his pastoral role put him in a position of trust and gave him access to the children of his congregation. He would sit at their dinner table and molest their child during his visit. Now the Houstons can rewrite history and return to their bubble of Hillsong, showing zero compassion in reaching out to victims of Frank Houston, which became apparent at the RC. They are too busy keeping Frank’s past at arm’s length, protecting the Hillsong and Houston brand and spinning the story so Brian gets sympathy and honor rather than take responsibility for the way he failed to provide for and protect the victim of his father, and how the AHA matter was covered up, as exposed in the RC. So according to Bobbie, what did she think Frank repented of? Is she familiar with the behavior of Frank the way he was with Brian and the victims in their father/son attempt to silence AHA and others? The difference between the Hillsong community and the community that exists outside of Hillsong is lawful behavior. That is the difference between a cult and a Christian institution. When Hillsong conditions people to think the same way, speak the same way, submit the same way, feel the same way, ignore laws and policies, disregard commissions and legalities to further their movement (‘For This Cause’) – society will always provide a safer community. No matter how many criminals there are within that community outside Hillsong, that community will at least have a legal system to hold people accountable. You can’t protect children, families and individuals when leaders of communities think they are above any morals, laws, policies or legalities and reinforce this mindset in its followers. These are the relevant pages from the Australian Women’s Weekly report. ‹ This is the best preaching segment C3 could find on Phil Pringle?